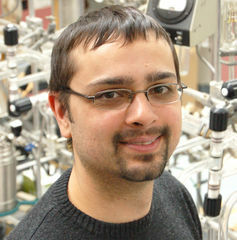 Neil Banerjee (UWO) uses a multidisciplinary approach to study modern and ancient oceanic hydrothermal systems including links with the deep biosphere. He has recently pioneered research focusing on the biogeochemical effects of water-rock-microbial interactions using C and O isotopes to detect microbial biosignatures and constrain environmental conditions in ancient rocks that have undergone deformation and metamorphism. His research demonstrates that textural, isotopic, and geochemical biomarkers are preserved for billions of years and proposes a new geological setting for the development of early life. Such systems are instrumental for the development of life in the solar system where liquid water and other conditions were suitable. He is applying his work to hydrothermal systems in impact craters and the search for habitable zones on other worlds, including Mars. His work on ancient life was highlighted as number fourteen of the “Top 100 Scientific Stories of 2004” in Discover magazine and aired on The Discovery Channel as part of a Mars series in 2007. Dr. Banerjee’s Laboratory for Stable Isotope Science will provide CATP trainees with hands-on, state-of-the art training in advanced stable isotope and other laboratory techniques, field investigations of modern and ancient analogue environments, and access to an exceptional meteorite collection at UWO with the ultimate goal of life detection on other worlds.